Collect, customize and compete with Beyblade Legends spinning tops! BB-59 Burn Fireblaze 135MS Top is a five-piece top with a Wings Spin Track piece that pushes down to stabilize the top's spinning attack and a Right Rubber Flat Performance Tip part for increased gripping power. This top's performance type is attack - built to move aggressively and hit opponents with power. Beyblade products are produced by Hasbro under license from d-rights, Inc. and manufactured under license from Tomy Company Ltd. Collect, customize and compete with Beyblade Legends spinning tops! BB-30 Rock Leone 145WB Top is a five-piece top with a Wings Spin Track piece that pushes down to stabilize the top's spinning attack and a Right Rubber Flat Performance Tip part for increased gripping power. This top's performance type is attack - built to move aggressively and hit opponents with power. 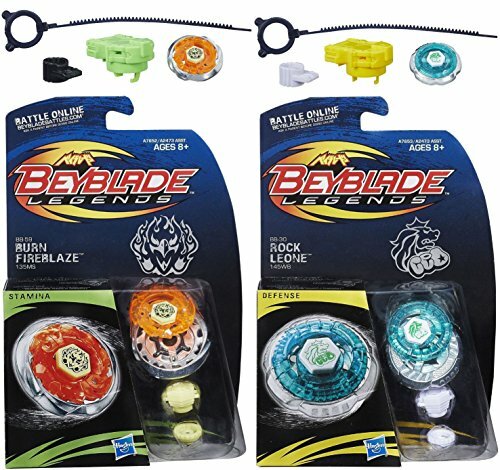 Beyblade products are produced by Hasbro under license from d-rights, Inc. and manufactured under license from Tomy Company Ltd.